The real Col. Sanders was an entrepreneur who didn't become a professional chef until he was 40, didn't franchise Kentucky Fried Chicken until he was 62, and didn't become an icon until after he sold his company at 75. According to a 1970 New Yorker profile by William Whitworth, as well as biographies from Bio and the University of Houston, here are the highlights of the Colonel's remarkable rise to success. Harland Sanders was born in 1890 and grew up on a farm in Indiana. When he was 6 years old, Sanders' father died, leaving him to take care of his younger brother and sister while his mom spent long days working. One of these responsibilities was feeding his siblings, and by age 7 he was already a decent cook, according to the New Yorker. His mom remarried when he was 12. Because his new stepfather didn't like the boys around, Sanders' brother was sent to live with an aunt while he was sent to work on a farm about 80 miles away. Sanders soon realized he would rather work all day than go to school, so he dropped out in the seventh grade. In addition to a stint in Cuba with the Army, Sanders spent the first half of his life working a series of odd jobs, including stoking the steam engines of trains throughout the South, selling insurance, selling tires, making lighting systems, and operating a ferry boat. He acquired a service station in Corbin, Kentucky, in 1930 and began serving classic Southern dishes to travelers. The location became known for its food, and Sanders eventually got rid of the service station's gas pump and converted the location to a full-fledged restaurant. His breakthrough came in 1939 when he found that frying his chicken and its signature "11 herbs and spices" in a new device, a pressure cooker (different from the ones used today), resulted in the ideal consistency he had been looking for. Sanders' restaurant enjoyed great popularity over the next decade, and in 1950 the governor of Kentucky named him colonel, the highest title of honor the state can give. Sanders began dressing the part, adopting the white suit and Kentucky colonel tie that would help make him a pop-culture icon. In 1952, he made a deal with his restaurateur friend, Pete Harman, to sell his chicken dish as "Kentucky Fried Chicken" in exchange for a 4-cent royalty on every piece sold. After it became a top-selling item, Sanders made the same deal with several other local restaurants. Things were going great, but when a new interstate bypassed Sanders' restaurant, it spelled doom. He sold the location at a loss in 1956, leaving his $105 monthly Social Security check as his only income. Sanders then decided that he was not going to settle for a quiet retirement. 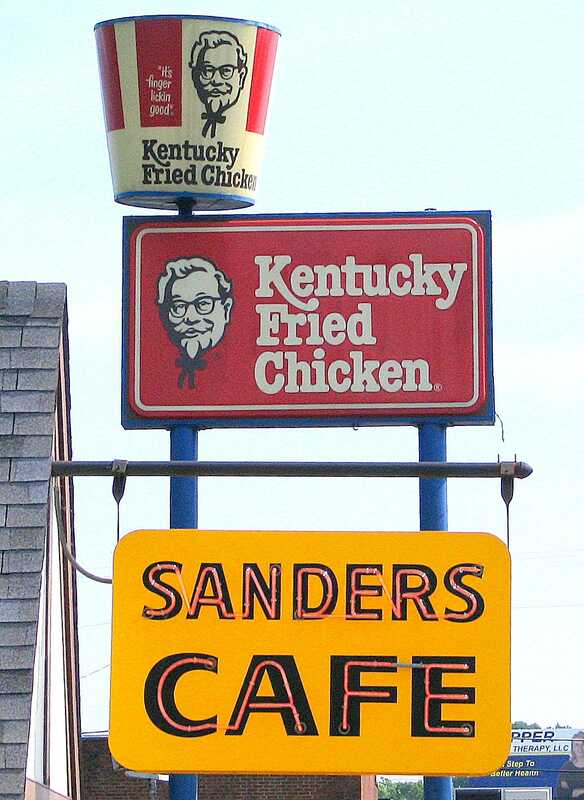 A KFC and Sanders Cafe sign at the site of Sanders' Corbin, Kentucky, restaurant where he developed his signature fried chicken. Since he'd closed his restaurant, the Colonel decided to dedicate himself fully to the franchising side project he'd started four years earlier. He hit the road with his wife, the car packed with a couple pressure cookers, flour, and spice blends. He would enter a restaurant, offer to cook his chicken, and then make a deal if the owner liked what they tasted. By 1963, Sanders was fielding franchise requests without having to put in the legwork, and had more than 600 restaurants across the US and Canada selling Kentucky Fried Chicken. That October, he was approached by John Y. Brown, Jr., "an aggressive young lawyer" as the New Yorker puts it, and a venture capitalist named Jack C. Massey who wanted to buy the franchise rights. Sanders was initially reluctant, but after weeks of persuasion, he agreed to sell his rights for $2 million ($15.1 million in 2015 dollars) in January 1965, and the deal went through in March. Under the contract, the company Kentucky Fried Chicken would establish its own restaurants around the world and would not compromise the chicken recipe. 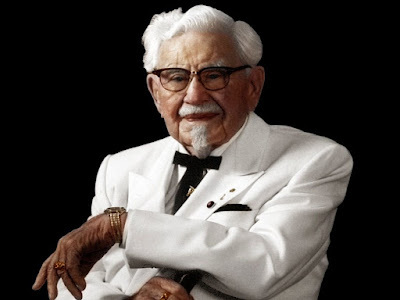 Sanders was to have a lifetime salary of $40,000 (later upped to $75,000), a seat on the board, majority ownership of KFC's Canadian franchises, and would serve as the company's brand ambassador. Sanders wasn't happy to let go of his baby, but at 75, he decided that it would be best to see his company continue to grow beyond his capacity. The New Yorker profile noted that some of his friends believed Sanders was shorted on the deal, but it also shows that Sanders turned down stock in the company and did not negotiate for a higher price. It seems Sanders' pursuit was never really about becoming rich, but rather about becoming renowned for his food. That's why he constantly grumbled and swore about the more profitable but lower quality gravy that the corporate KFC began producing. "If you were a franchisee turning out perfect gravy but making very little money for the company and I was a franchisee making lots of money for the company but serving gravy that was merely excellent, the Colonel would think that you were great and I was a bum," a KFC executive told the New Yorker. "With the Colonel, it isn't money that counts, it's artistic talent." Brown, who sold his stake in KFC in 1971 for $284 million, became governor of Kentucky in 1979. When Sanders died the next year, Brown said Sanders was "a real legend" and "the spirit of the American dream," the New York Times reported. Sanders may have lacked the motivation to become as wealthy as he could have been, but he's now known in 115 countries for his favorite fried chicken recipe, which is more than he ever could have hoped for when he hit the road at age 65 with a car full of cooking supplies.